Warminster resident Tiffany Irene Banks, 24, top left, and Mark Anthony Vandenberg II, 26, top right, face heroin distribution charges. 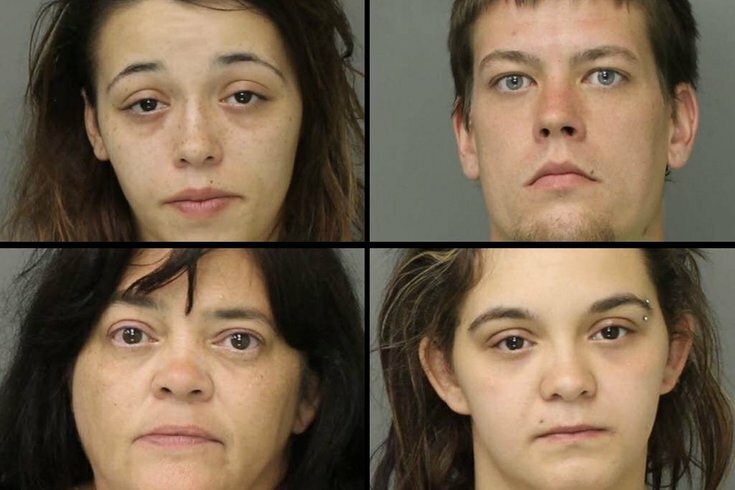 June Elizabeth Szweda, 50, bottom left, and her daughter, Brittany Alicia Banks, 26, bottom right, were charged with possession of drug paraphernalia, police said. Two Warminster residents were arrested and charged Friday with distributing heroin after police served a search warrant at a home in the 300 block of Lemon Street in connection with a drug trafficking investigation. Tiffany Irene Banks, 24, and Mark Anthony Vandenberg II, 26, were charged with delivery of heroin, conspiracy to deliver heroin and criminal use of communication facilities, police said. The homeowner, June Elizabeth Szweda, 50, and her daughter, Brittany Alicia Banks, 26, were charged with possession of drug paraphernalia, police said. The arrests followed a tip-based investigation by Warminster detectives that allegedly indicated residents of the home were distributing heroin. As a result, Warminster police said they seized numerous bags of heroin, packaging materials, cutting agents and other drug-related paraphernalia. The investigation is ongoing and additional charges may be filed, police said. Banks and Vandenberg were arraigned by Magisterial District Justice Jean Seaman in Jamison and committed to the Bucks County Correctional Facility in lieu of $50,000 bail. Court dates have not yet been set.